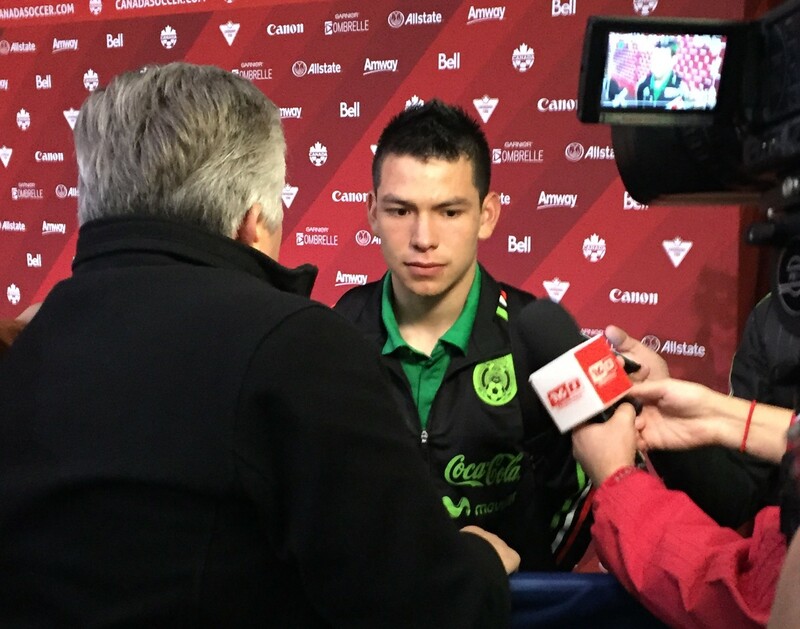 VANCOUVER, BC – It was a bit of a surprise to see Hirving “Chucky” Lozano in the starting line-up for Mexico in front of the largest crowd to ever see the men’s national team play at BC Place. Mexico coach, Juan Carlos Osorio deliberated up until the last minute. Osorio went with Chucky, who took the field along with Jesus Corona and Javier Hernandez to make up Mexico’s line of attack. The move paid off as all three were able to find the back of the net in Mexico’s 3-0 victory over Canada. Lozano, in particular, was especially devastating. If it was not his speed, it was his ball control. If it wasn’t his darting runs, it was his defense. And when he dispossessed Canada late in the first half, all Javier Hernandez had to do was send the ball into space like a bucket of chum ready to be gobbled up by a lethal shark. Lozano caught up to the ball while leaving three defenders in his wake, he picked his spot and calmly slotted the goal home past Canadian keeper Milan Borjan. If Canada’s forwards would have shown the same calm in front of goal, this game may have had a different story. Osorio praised Chucky in his post game comments. Canada did start the game with their hair on fire. They were winning the 50-50 balls and making Mexico very uncomfortable with high pressure. Mexico’s midfielders could not find space to collect the ball, which forced Mexico’s defenders to send even more 50-50 balls up the pitch. But it was Mexico’s high pressure that tilted the game in their favor. Once Mexico’s midfielders were able to control the ball, they were able to feed the three forwards and two wingbacks. One of those Miguel Layun, found himself back in his more comfortable position of left back. He provided a pinpoint cross to Javier “chichairto” Hernandez for the first goal of the match in the 31st minute. Knowing he had just gotten world class service from Europe’s leading assist man, Javier was quick to point him out before striking his customary post-goal pose. Prior to that goal, it was Layun who had come closest for Mexico, forcing another huge save by Borjan and sending another just beyond the crossbar. A few minutes later, Chicharito pounced on an Hirving Lozano cross to make it 2-0, but was denied by the post, as was Hector Herrera a few seconds later. Lozano then seemingly put the game out of reach with his first goal on the senior team in the 39th. By that point it was clear that Mexico was in a different class than Canada, a point that Canadian Coach, Benito Floro had brought up earlier in the week. “It is very difficult for even the best teams to put together a squad in order to make a magical run, so imagine me trying to do it in a country that has no league.” Floro mentioned in one of the pressers leading up to the game. It wasn’t that Canada was that bad, a good portion of their players are just not used to competing at a high level. Tonight, Mexico proved they are on another level. With the win, Mexico takes a commanding position in Group A with 9 points. Despite the loss, Canada is still very much alive to make their first hex in 20 years as they sit in 2nd place with 4 points. El Salvador and Honduras, who played to a 2-2 draw earlier in the day, round out the group with 2 and 1 point respectively. Mexico and Canada play again on Tuesday, this time at the Estadio Azteca. As for Irving Lozano (and to a lesser extent, Jesus Corona), their play in Canada showed that Mexico has plenty of young, fresh depth on the attacking front. It also sends a signal to Giovani Dos Santos and Carlos Vela that they are going to really have to step up their game if they want to be a part of what could be a special summer for Mexico. For Mexican soccer, the trend of losing young, ambitious players to European leagues has started to become a concern. There are very few young, marketable, Mexican stars that have the potential to be the face of league. It will be interesting to see if one of the bigger teams make an obscene offer this summer to keep Chucky in Mexico.